As regular readers will be aware, my job requires me to travel to Singapore every two to three months for business purposes. As a rule I land in country late on Saturday afternoon, giving me a day and a bit to recharge batteries before I have to be useful. At one stage I thought that I might buy an annual pass for Universal Studios Singapore, but that idea fell by the wayside after my last visit because the mandatory locker policy made the experience an ordeal instead of the pleasure it should have been. Since then my usual Sunday routine has been a late breakfast, a few hours in the gym, a Gold Class movie, and an early dinner. 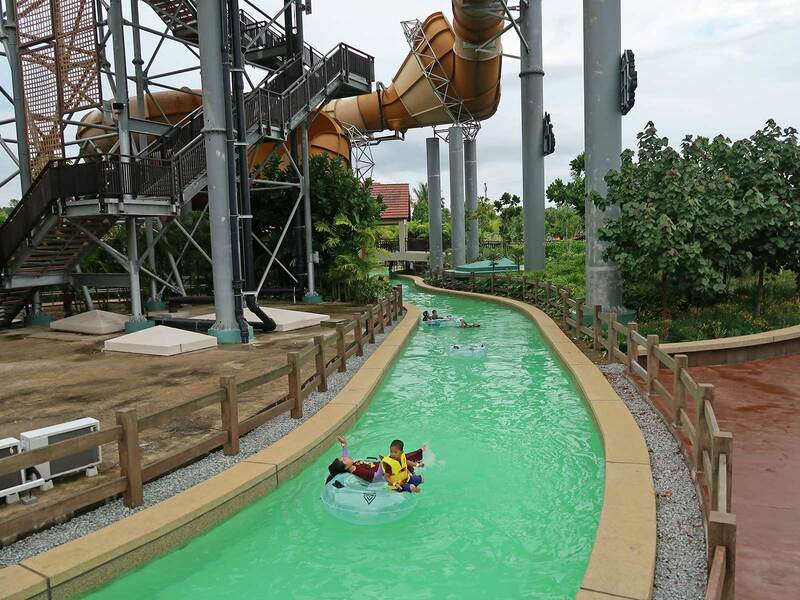 For this trip I decided instead to book a package tour from WTS Travel to the new Desaru Coast Adventure Waterpark located in the south-eastern corner of Malaysia. I'd expected the journey to take us across the Johor-Singapore Causeway, but our driver decided to use the Tuas Second Link instead. This seemed like a strange choice at first glance, given that it was around forty kilometres longer, but I've since realised that it had the advantage of using motorway for virtually the entire distance, making for a much more comfortable drive. The two customs checkpoints were very fast today, unlike on my last trip, and as a result the journey took around two hours and fifteen minutes from door to door. The park is promoted as "one of the world's largest water parks", and while that might be true in terms of raw size it belies the fact that the twenty-one acre facility has a great deal of open space. There are thirty-five numbers on the map, but that's only because the designers have labelled everything they can think of; there are separate entries for the Penawar River and the Penawar River Entrance, separate entries for the Entrance and Exit, and there's even a number for Hard Rock Hotel Guests Only. 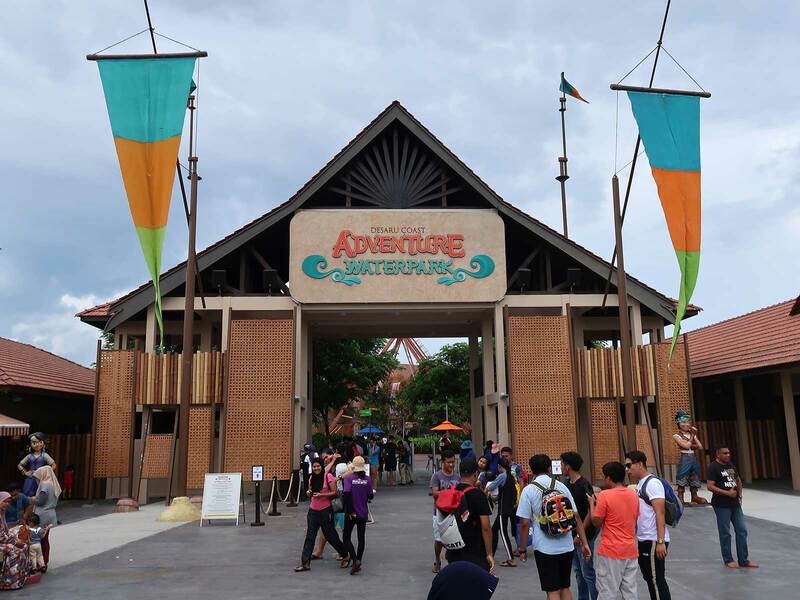 The metric that matters to the average visitor is the number of rides, slides, and pools, and that's where the truth is revealed; as of this writing the park has twelve, which is one less than the Legoland Waterpark has installed in around one third of the space. More to the point, there are only nine of interest to anyone over the age of ten: four slides, a pirate ship, a water coaster, a lazy river, a huge wave pool, and a surfing simulator. The paucity of attractions was painfully obvious for my visit, as all of the majors had wait times in excess of forty-five minutes despite inclement weather. I was only able to manage six rides in six hours, and that was without stopping for food. On the positive side, the park does look the part. The general theme is that of a Malaysian fishing village, and there is a consistency of presentation that works very well. The staff are without exception friendly; every time I looked at one my glance was met with a smile, and while announcements were only made in the local patois staff made a point of personally delivering an English translation to anyone who looked vaguely western. There was a good selection of park merchandise in the gift shop, and the food and drink prices were very fair. Credit cards were accepted throughout; though I had a small amount of local currency with me I could easily have gotten away without it. The only thing that I really didn't like was a strict no re-entry policy; each wristband can be used once and only once. Visitors from western countries might be surprised to learn that virtually all guests today were wearing t-shirts with their swimwear; those of us who chose not to could be counted on one hand. This would seem to be a technical violation of the park's dress code, which states that proper swim attire is required, but that rule was just one of a number that was being widely ignored. Another forebade the use of mobile phones on rides and in pools, yet a sizeable percentage of guests had waterproof phone cases hanging from their necks, and I later discovered these on sale at one of the park shops. The one rule that I did see being rigidly enforced was a requirement to wear life jackets in the wave pool, suggesting that Malaysia has its own supply of lawyers seeking to justify their existence. I decided to begin my visit with a quick photo run centered around the park's water coaster, a Mack creation that was the primary reason for my visit. After about ten minutes the heavens opened in dramatic fashion, which I took as my cue to switch into swimwear. Soon after I'd deposited everything into a locker and headed back for my credit, only to learn that it was temporarily closed due to what was now little more than drizzle. My immediate reaction was a double-take and a request for confirmation, which was provided with an apologetic grin; in defiance of all reason, management at Desaru Coast Adventure Waterpark have decided that they will only operate their water coaster in dry conditions. Rather than camp out at the entrance I made my way over to the Penawar River where I enjoyed a few minutes of gentle floating. There was a mid-course waterfall, but the route split giving those who wanted to bypass it the option to do so. The two largest slides in the park use four-person ProSlide CLOVERleaf rafts, and both launch from the same tower. I'd expected to have to join another group for weight and balance reasons, but it was surprisingly difficult to achieve that in practice. At the boarding platform a number of groups indicated that they wouldn't be willing to share with a stranger, a fact explained to me by the operator with an apologetic "local people". I was rescued by an Australian couple on a road trip, and as they'd already experienced Riptide our return to ground level was by Tempest, an authentic Tornado slide with a yellow and brown funnel. I decided that going back for the other was more hassle than it was worth, and instead went for a spin on Wild Whirl which I was able to enjoy on my own. The top of the slide had revealed empty boats cycling on the water coaster, and I duly made my way back across to it only to find the multitudes pouring out of the queue. No barrier had been put up, and given that I decided to join the few hardy souls camping out in line. I'd been in situ for no more than ten seconds when an operator came over to me to say that the ride was closed due to lightning in the area, but that I could wait if I wanted to. I decided that sitting down for a while was preferable to standing in line for another slide, especially given the thick clouds in the sky that promised further rain. In due course my patience was rewarded with the announcement that the ride was now open. Kraken's Revenge (#2546) has a themed antechamber immediately prior to its boarding station with capacity for perhaps thirty guests. Each wall has two enormous flat screen televisions that are presumably intended to add atmosphere, though they were powered off today. The room also features a number of nautical props, including a small cannon which isn't secured to anything and which can easily be sent rolling across the room by children and/or the terminally immature. Seating is on a first come first served basis, though single riders are moved forward to occupy gaps, leaving me with my first lap in the second row instead of the back seat that I'd hoped for. 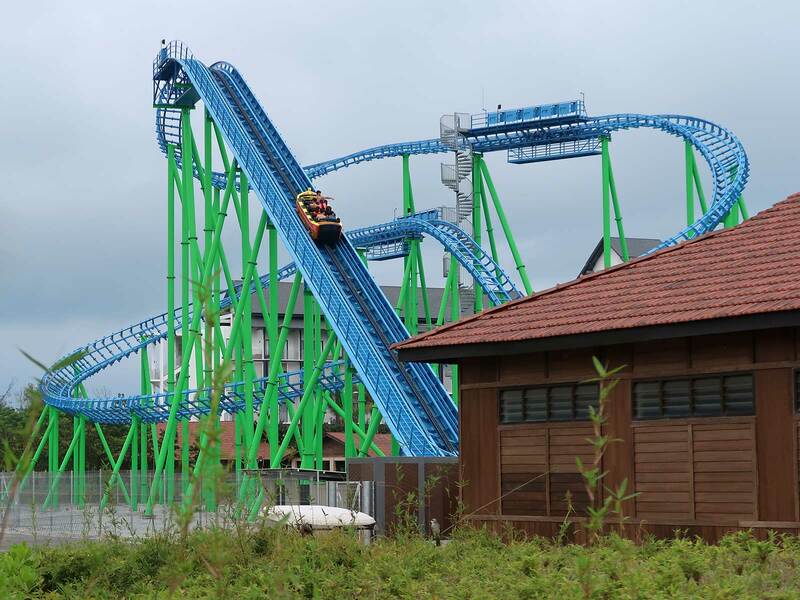 On the plus side, this gave me a clear view of the ride mechanics, which are quite interesting. The ride uses a standard chain, but it is engaged only after the boats are lifted out of the water by a separate conveyor belt. I concluded that this was both to protect the mechanism and to minimise the amount of axle grease landing in the water trough; while the system will inevitably get wet it is probably best if the chain isn't continuously immersed. There are two separate sets of anti-rollback ridges on the ascent, one on each side of the boat, though they are inaudible in regular operation; one presumes that they are held out of the way magnetically until they are actually needed. At the apex there is a short pre-drop of a few feet, and today this was all that was needed to trigger maniacal screams from the locals. The right turning descent that follows goes almost to ground level, and the boats negotiate it effortlessly, in sharp contrast to recent Intamin efforts. The climb that follows leads to a straight drop, an airtime hill, and a splashdown that delivered a mild spray rather than a drenching. My second lap in the front seat almost an hour later was similar, indicating that one could probably ride fully clothed without particular difficulty. My last ride was on Super Twister, a tube slide with three triangular shaped direction change modules. I've a feeling that these were supposed to turn me ninety degrees, but I hit the third at an awkward angle and ended up going backwards for the final segments of the descent, which certainly made things interesting. There wasn't enough time for anything else after I splashed down, so I made my way back to the changing rooms. These were clean, but lacking in both hot water and soap; enthusiasts making their own trip might want to plan for the latter.